“I love to build models. The pleasure I get from completing a model is only exceeded by the enjoyment I got from building it. This is especially true of a working model. Once it is completed, there is the added thrill of getting it hot, and seeing it run! Hopefully these instructions will be easy for you to understand. But if you find something that you don’t understand, take a few minutes and re-read the instructions. Showing these instructions to a friend can also be a good idea. Very often what isn’t clear to one person will be clear to another. Before you start building your engine, decide how pretty you want the finished product to be. If you want a stunningly beautiful engine click here for additional instructions. If you are more interested in simply seeing your engine run, then clean off your workbench, get out your glue, and roll up your sleves. This is a fun project! Start by making sure that you have the tools and adhesives to build your engine, then click here to take inventory. You are now ready to assemble your engine. 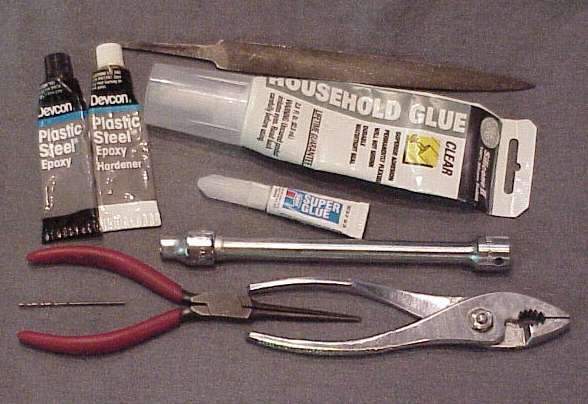 Throughout the assembly instructions, the term "adhesive" is used. Except where specifically noted, you can use super glue, Loctite, epoxy, or silicone bathtub caulk wherever the term "adhesive" is used. In some situations, the adhesive you use must be thick enough to create an air tight seal. In these cases you should use either epoxy or silicon caulk. This will be noted in the instructions. 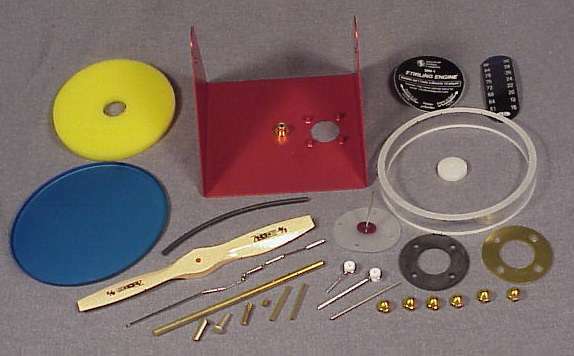 You can purchase clear silicone caulk, which can help make the assembled kit look nicer than with colored epoxies. Silicone caulk also is thick enough that it will not flow, minimizing accidents where adhesive goes where it is not wanted. Also, if you purchase a small tube of silicone caulk, it will be easy to make a clean bead on the Cylinder: doing this with epoxy is not as easy. If you use epoxy, the recommended type to use is a clear epoxy that cures in about 30 minutes. American Stirling Company uses a brand of epoxy called Devcon 2 Ton Clear. Using a 30 minute [instead of 5 minute] epoxy gives you time to correct your glue mistakes. In some places, you must use epoxy, and the term "epoxy" is used in these situations.